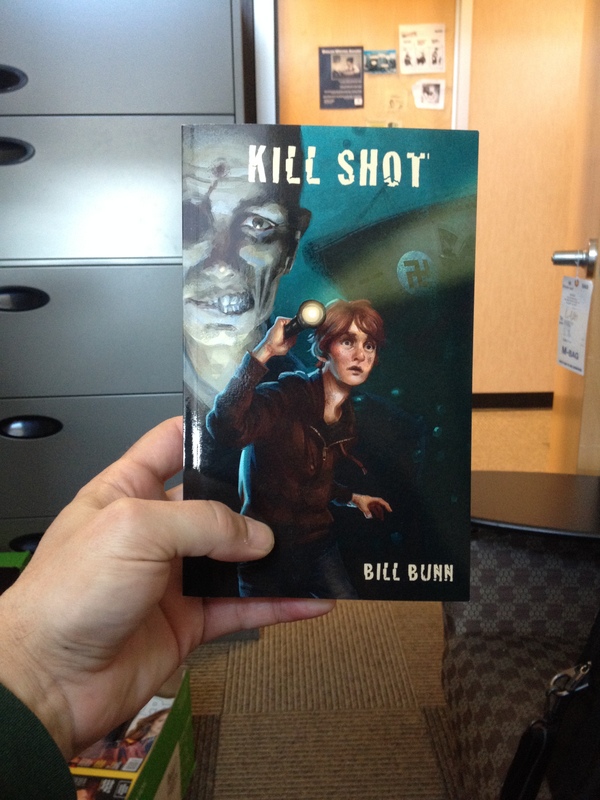 “Kill Shot” is in my hands! | Welcome to the official Bill Bunn author site! Officially, Kill Shot comes out in May. Yet, I have a pre-press version of Kill Shot in my hands. I was helping promote the book and Bitingduck Press at the Los Angeles Times Festival of Books, held this past weekend (April 18 & 19, 2015). Bitingduck editor Jay Nadeau had some pre-press copies made and brought them to the event! What a lovely surprise! Kill Shot was inspired by the 2012 sonar discovery of a vessel with the dimensions of a WWII-era German U-boat–the submarine was detected a hundred kilometers from the ocean, in the Canadian province of Labrador. More than a dozen U-boats remain unaccounted for, the fate of their crews unknown. Fully fictional, the story switches between the events of the war that led the German crew to submerge and eventually die in the river, and the adventures of a young man finding the boat over seventy years later. Wednesday Smythe is a pimply 14-year-old high school freshman whose parents died when he was too young to remember them. Shuttling between foster care and a group home, he finds himself in a rural trailer with a hair-cutting entrepreneur for a mother and an unemployed father who pawns the foster kids’ goods to pay for fancy shampoos. Without phone, Gameboy, or iPad, Wednesday is forced by boredom into long walks along the river, where the discovery occurs that will change his life. Wednesday’s first friend at his new home, a girl called “Stump,” has been raised by her reclusive homeschooling father with almost no social contact. She can’t use a phone, but she can wield a chainsaw. Wednesday’s other friend, Wally, is embittered and angry in foster care, lashing out in ways that threaten Wednesday’s growing rapport with his new family. All three are drawn together in a fast-paced adventure pitting their wits against the bad guys who want the boat to stay hidden, and the cops who want to bust them for any number of nefarious deeds.